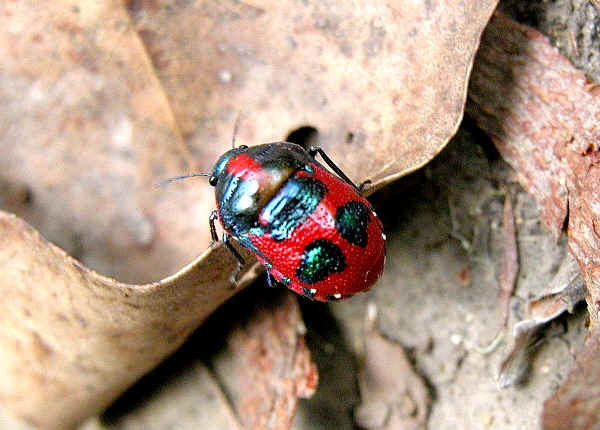 This page contains pictures and information about Red Jewel Bugs that we found in the Brisbane area, Queensland, Australia. In mid summer during bush-walking in the rain forest near Mt Nebo, we saw this bright red bug resting on a tall glass leaf. When we came closer to take some photos, the bug dropped onto the ground and run away quickly. The Jewel Bug is carmine red in colour with purplish-black markings. Body strongly convex above and below. 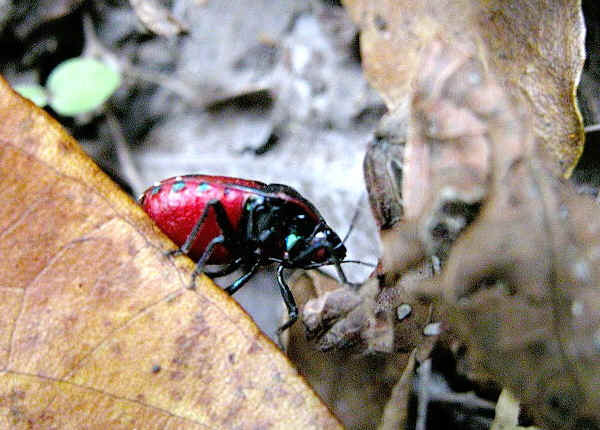 The bug feeds on Forest Hop Bush Dodonaea, feeding mainly on the seeds. 1. Insects of Australia, CSIRO, Division of Entomology, Melbourne University Press, 2nd Edition 1991, pp 508, plate 3. 2. Choerocoris paganus (Fabricius, 1775) - Australian Biological Resources Study, Department of the Environment and Heritage, Australia 2005. 4. Plant-feeding and Other Bugs (Hemiptera) of South Australia. Heteroptera-Part I - Gross, G.F. (1975). Adelaide: A.B. James, p94, plate C.